Now, with a new introduction written by critic/blogger Jessa Crispin, I Await The Devil’s Coming stands poised to renew its reputation as one of America’s earliest and most powerful accounts of feminist thought and creativity. MARY MACLANE was born on May 1st 1881 in Winnipeg, Manitoba, Canada. Her family moved to Minnesota while she was young, then again to Montana after the death of her father and remarriage of her mother. 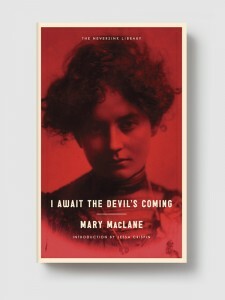 She began writing for her school paper in 1898 and published her first book, which she called I Await the Devil’s Coming — and which her publisher changed to The Story of Mary MacLane — in 1902 at the age of nineteen. She died under mysterious circumstances in Chicago in 1929 — according to reports, she was found dead in a Chicago hotel room — at the age of 48, and her works fell almost immediately into obscurity. Thus does feminism stride into the new millennium: Chick Lit author to shill for "girlie" wine . . .
Was Keats killed by a bad review?